Parents are increasingly facing a problem that just years ago would have seemed unfathomable: their kids are addicted to vaping. The rise in teen e-cigarette use has been reiterated in study after study this year — the latest from the National Institute on Drug Abuse showed a near doubling in the rate of high school seniors using e-cigarettes, jumping from 11% to nearly 21% in just a year. The study also showed more than 1-in-10 middle schoolers reported vaping in the past year. As the surge in teen vaping continues and sales at the country's largest e-cigarette maker Juul Labs rise exponentially, parents are taking matters to another level to help protect their children. As a result at-home nicotine test kit makers are experiencing a sales spike. Sales of at-home nicotine testing kits on Amazon have skyrocketed. The most popular testing kit, based on Amazon’s sales ranking, made by King of Prussia, Pennsylvania-based Devon Medical, has seen its health and beauty category sales ranking improve this past year. Back in January 2017, Devon Medical ranked 15,000 compared to 1,000 in November, according to e-commerce tracking firm Keepa. Sales rank is a frequently used measure by Amazon’s third-party sellers to track the relative performance of products since Amazon sales data is kept private. 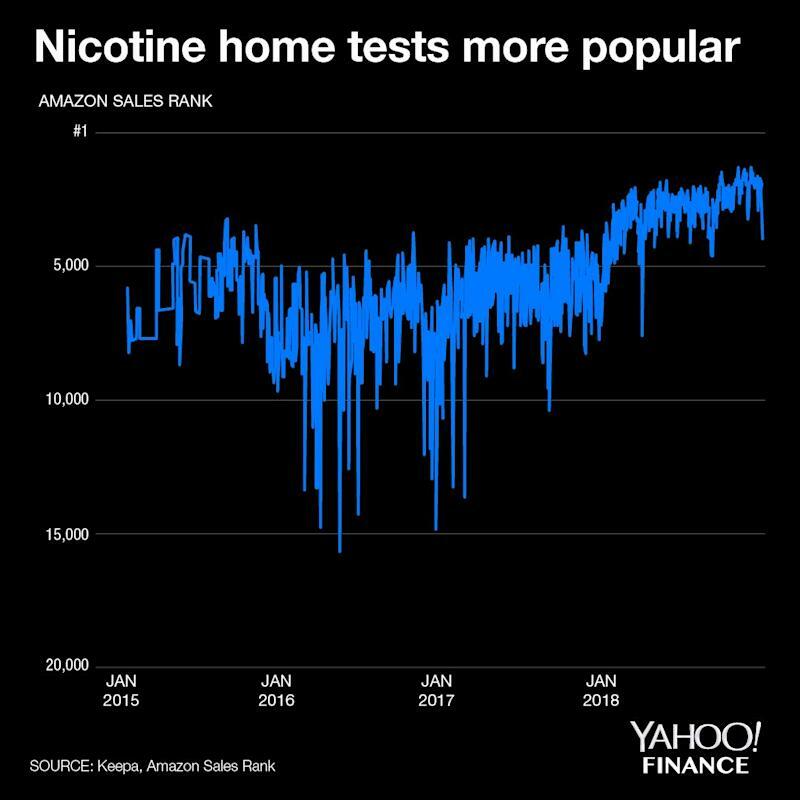 Amazon declined to comment on the rise in popularity of the nicotine test on its platform, but reviews left by customers on the product’s Amazon listing shed light on what was driving at least a portion of its purchases. The top-rated comment made it clear: fear. A customer, who purchased one for her 14-year-old, said it was a worthwhile last line of defense. “It’s rampant in the middle schools now and this was what worked best!” she wrote. Requests for an interview with Devon Medical CEO Chip Ross went unanswered. Parents turning to at-home test kits to monitor their children isn’t necessarily unexpected. As Boston Children’s Hospital Pediatric Addiction Fellow Dr. Nicholas Chadi told Yahoo Finance, parents have increasingly become desperate for treatment options. The hospital’s addiction program he helps oversee has recently fielded six-times the call volume from parents and pediatricians looking for ways to help nicotine-addicted teens. It’s also not necessarily as easy to measure one’s nicotine consumption as it is with smoking traditional cigarettes as e-cigarettes are consumed by the replaceable “pod.” A single Juul pod can contain as much nicotine as a pack of cigarettes. After implementing regulatory changes with the top e-cigarette manufacturers in November, FDA Commissioner Scott Gottlieb hinted Thursday at another wave of additional steps that could be taken to help curb teen vaping. Despite already moving to ban flavored e-cigarettes at retail locations and implementing stricter age verification for online sales, Gottlieb said he’d be meeting again with top e-cig CEOs to discuss furthering efforts. Juul contends their popular e-cigarette was originally built to wean smokers off of traditional cigarettes. Ironically, it has now become the very device so many parents are hoping to wean their addicted teens off of. In a second layer of irony, and much to the chagrin of anti-tobacco groups, the FDA has scheduled a hearing for January to discuss drug therapies that might help underage users curb their vaping addictions. “The very fact that the FDA has to have a hearing like this underscores our concerns about the kids that have gotten hooked on Juul and other e-cigarettes and now need help quitting,” a Campaign for Tobacco Free Kids spokesperson told Yahoo Finance. Following a $12.8 billion investment from Big Tobacco firm Altria Group that valued Juul at $38 billion, it’s unclear if the e-cigarette behemoth that has grown to control roughly 75% of the e-cigarette market plans to do more than it already has to prevent its product from being used by children. Depending on what additional steps the FDA has in mind, it might not have a choice.